All you need to do is follow the included instructions for calibrating the probe and connect it to the included pH Circuit. The pH Circuit outputs data from the probe over serial, so it couldn't be much easier to use. Electrical: pH sensors have impedances on the order of 10 gigohms to 1 teraohm. The supplied PCB might kill the low voltage signal due to surface conduction if the solder flux wasn't cleaned well or if you spilled some gack on it. Most pH meters bring the signal pin in on teflon standoffs and lift a leg of the IC dead bug style so that the signal never even touches the PCB. Very few op-amps have a high enough input impedance to handle pH signals. Think of these sensors as being a zero-current reference battery with a pH-dependent output voltage. Chemical: The best storage solution in between uses is a pH 4 buffer with a lot of potassium chloride added. Not sodium chloride. The cell uses potassium chloride in it's internal reference cell and in the "salt bridge" which makes the ground connection into the water sample being tested. pH membrane glass is (barely) conductive to a current consisting of hydrogen ions (not electrons). This storage solution keeps the glass membrane primed. Physical: this sensor is probably not compatible with direct soil measurements. The connection will be poor and you can easily break the thin bulb. If you're careful not to poke any gravel or twigs into the glass you could try mixing up some mud using deionized water and measure that. I am using the circuit and probe for a hydroponics system. I was wondering if you found an alternative that works better for you? I'd be interested in exploring other options as they become available. Always good to know what is out there! I am also seeing this issue. Any help from SparkFun? If you're getting weird characters that change with the baud rate, it sounds like you simply have the wrong baud rate selected for some part of your system interface. If there's a mismatch between your serial terminal and what your sketch is running your serial connection at, you'll get the behavior you're describing. Sweet. I'm in the (long) process of setting up a planted Aquarium, with high power lights, fertilizer, and CO2 injection. PH controlled CO2 injection is the best way to go, but the controllers are $200+. But with this and an ATmega328 chip, I can do it for half the cost! Can the probe be left in a liquid (like swimming pool water) continuously or is it meant to be used intermittently ? "After calibration, the pH probe can be immersed in a liquid and operate continuously for 12 months before recalibration is recommended." Para que servem as portas "Do", "To" e "Po" no sensor de pH para arduÃ­no? Just go with the Vernier probe and their shield. Comes out to almost the same price, but theirs is in my experience very resistant to water damage. Only thing you're sacrificing are the standard buffers. This documentation is ridiculous, the wiring diagram says to use a breadboard and then page 12 of the datasheet says do not use a breadboard. Why are there male headers on both the BNC adapter board and the PH Circuit? This makes absolutely no sense to me. i did all necessary wirings. When i tried to read ph , it always give me 7 ph. What should i do is there anyone who crosses this problem . I need urgent solution. check BNC to circuit wiring. BNC connector pinout is 1st reserved, 2nd PRB, 3rd GND. I have a strange problem with this kit, on the breadboard it is working like a charm, but as soon as i solder the BNC connector and the stamp together it stops working, it just shows a ph of 7.00, it is extremely strange, i have made a very nice and proper PCB for it, checked all connections and everything, all is very fine and all is very clean. I have tried and experimented a lot and i rely can't understand it, my last crazy idea is that it does not like some property of the solder, but i think this is a bit crazy, i am using spark fun's 0.020" special blend. Have anybody else had similar problems or anything like that??? i got the same problem. take a look at the BNC connector, 3 pins. 1st pin is reserved, 2nd @ middle is PRB, 3rd is GND. at first i thought the pin configuration is 1st PRB, 2nd and 3rd is GND. after a while, i got the same error again. i thought maybe there is something related to power supply. so i soldered capacitor 0.1uF to VCC and GND near the pH circuit 5.0. for the time being, it works well.. I had the exact same problem. after soldering always got PH 7.00. I had luck i guess, my problem was the obvious one. the prb exit of the BNC connector wasn't soldered right to the stamp. Interestingly this kit, however I have a question, do you have automatic temperature compensation or compensated?. What about selling the shield by itself for deeper application development combining with other sensors for fully automated "garden" idea, just a thought. I guess you would need the probe too. Just had an IOT idea, yet don't want to have to house a bunch of chemicals, when seeking strictly the electronic aspects. I've looked at a bunch of different PH shields and kits, this appears to be the best. I have only one concern, and hope someone here can help me around it. I need to use my serial communications continuously, and also want to have a continuous PH level feed. The datasheet looks like this will require the data to be transmitted via a serial connection. Has anyone found a way to communicate without using the serial connection? I'd prefer a 2-wire type interface like another arduino shield I found, but this appears to be a superior design. What version of the board are you selling? The picture shows 3.0 and the manual is for 4.0. 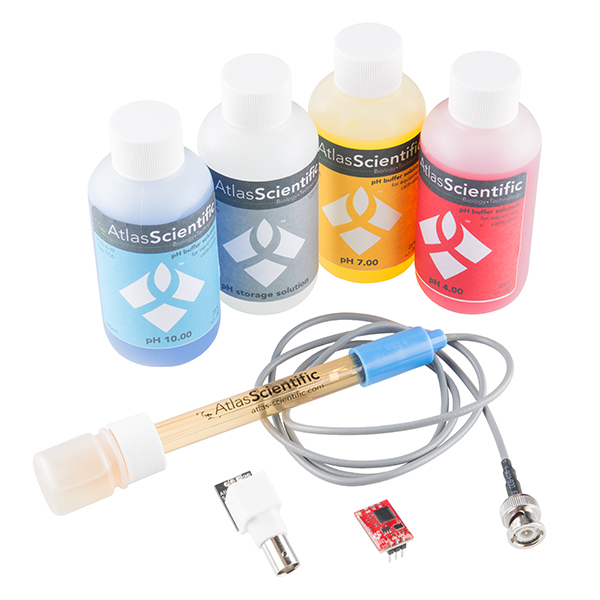 Atlas Scientific is currently selling 5.0. The kit currently comes with a V5.0 stamp board. In regards to having the fees listed on the site, this is nearly impossible unfortunately. Each country has their own fees and not every country uses the unified tariff schedule, and if they do, it can vary. So, we apply the tariff codes that are used pretty universally, BUT each country has their own taxes, and interpretations for them (generally speaking). So, we would have to store all the rules for every country out there, which becomes quite problematic. Sorry to hear it was so expensive. Unfortunately, we have no control over customs/related fees, and I don't know if there are any systems in place to let us know about the exact cost associated with customs in each country, which is likely why we don't have the information posted. You may want to consider checking with our distributors closer to you. It should help negate some of the cost for shipping and customs. I imagine our IT department would have a fit if we asked them to indicate which distributors carry each product, as it sounds somewhat like a logistics nightmare, but we'll keep an eye out to see if there is a solution to make this more user friendly. Are they selling the latest version of the stamp? It seems to me that's the older version 5.0 version stamp comes with a layer of epoxy. 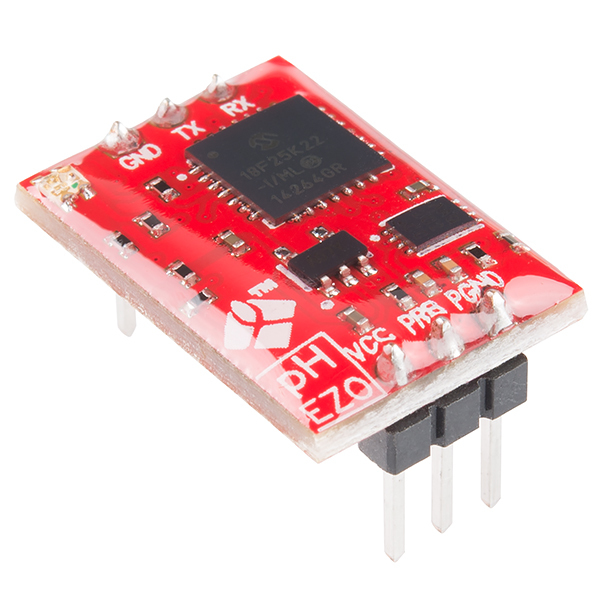 Does anyone at Sparkfun knows the current version of this sensor kit? Can anybody help me? I want to convert the pH-String in "sensorstring" in a float-type. Have anybody a code-snippet? PROBLEM CALIBRATE ! work with two stamps on arduino 2560 mega . all works fine -- but problem to calibrate to 10 ! no problem calibrate to Ph 7 - no problem calibrate to Ph4 but if i want to calibrate to Ph 10 it does not work :( the stamp gave me always a PH 7 back !! ?? I cant masure above Ph 7. Any idea why ?? Does anyone have an eagle library file for the stamp? When is the kit available again? i am doing a project. i wanna trigger LEDs, buzzer, LCD when certain range of pH is reached. Baud rate stuck on 9600. I can change brightness and other parameters, baud rate can't be changed. Any suggestions? I can't seem to get any returned data. I'm using the Arduino Uno. The sent string is received fine with the return button, but I don't get any readings! Hey there, when are you going to have this back in stock? Thanks! Anybody have any code that works with this? The examples definitely don't work the arduino uno, and I have been putting some considerable hours in trying to get a reading. Are you using a software serial port, or reading from the arduino hardware port then displaying on lcd? Also remember Tx-Rx, Rx-Tx and at a baud of 38400. I ended up building an interface like this one though it uses an Atmega328 so its arduino compatable, but the reasoning is the same. You send a command and the unit responds with the data or action you want. Here is some real basic code for the Atlas stamp using the uno hardware serial port. How the heck do I use the BNC connector? It looks almost made for a bread board but not quite. Any help? this electrode work to measure ground pH directly? this electrode to measure ground pH directly? Does anyone know if this pH kit will provide readings for a mineral springs pool instead of a classic chlorine pool? Y'all should definitely use this in a project with Mr.Plantsypants! Will you guys start to cary the otheer stamps by Atlas Scientific.... I was thinking making a sensor package for my Science Teachers would be an awesome gift! Are the probes single use? Nah, those probes work for years. They claim they should last about 2 years in a laboratory setting with proper care and use. You can find open source versions LeoPhi pH interface and MinipH, the site also has a handy pH interface write up that covers the basics of a pH interface pH tutorial. nope, sorry. but you can get it directly from atlas scientific. click on the 'product page' link above. what are the procedures for calibration? They are included in the instructions and are pretty clear and well documented. Anyone know if this suitable for a automated Aquarium water tester? I've always wanted to try and automate my mothers fish tank. Every time I get to go over there and clean her tank, its usually just after she lost a hand full of fish. If this isn't suitable for that, any one know of a sensor that is? It should be noted you need to rinse the probe off with a wash bottle of distilled water between each stage of calibration (4, 7 and 10 buffer) to prevent cross-contaminating the buffers. The buffers solutions are designed to resist changes to pH, but can become unstable if they're mixed. You'll also need to rinse off the probe before testing your sample liquid and again before storing the probe in the storage solution. What's with the plastic bottle on the probe? Is it removed during use, and is it food (beer) grade? You need to keep the pH probe in a buffer solution. This keeps them hydrated and ready to go. You slip them out of the solution to do the measurements. I don't know about the food grade part. I would not hesitate to use a probe for beer that I had ONLY used for beer. But that's me, and not advice. Darn ... needed this exact product with an I2C or 1-Wire interface. It includes code for I2C, does that mean it can speak I2C ? 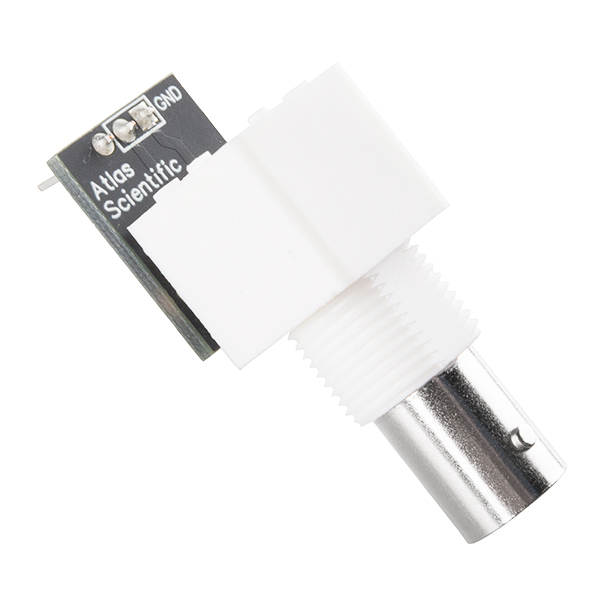 what is the white square component above the "Atlas Scientific"
Looks like a LED (Bi-color?) at least red and green, doesn't look RGB. Yep, looking at the date sheet it says it has a red and green LED, and that is the only thing on the whole board that would fit the bill. At first I thought it might be a challenge to set this up, as I haven't ever connected anything to GPIO or UART (I'm using a pi), but after about an hour of looking at the associated documentation, I had it up and reading fine. This was super easy to hook up and calibrate. I used the i2c on my Raspberry PI. It is fully waterproof and I have been using it to monitor the PH in my aquarium. I ordered this kit after reviewing a lot of other probes. One might consider this probe expensive but it's high quality and the Atlas support is first rate. If you're considering this kit, also consider purchasing the Atlas shield built for the Arduino. The shield simplifies the connection of the EZO Circuit and attachment of a temperature probe. It is a great product, the only thing that they missed to say is that there is one conector on the market that you can use to connect the BNC Connector and the PH circuit together.